Excellent product, good price, fast delivery what more can you ask. My old foil and cutters were a year old, the new ones are radically better, smoother and a cleaner shave. 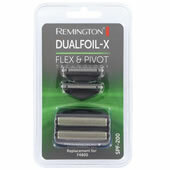 I have always used Remington,gives a lovely close smooth shave. I got my new shaver foils and cutters within 2 days of ordering on-line from shaver-spares.co.uk Ordering Service was excellent and very fast, would definitely use them again. Excellent service at a very good price. Amazed at how quickly i received the item. WELL DONE.